Jack Cresse made an impact not only on Tulsa radio, but also served with state and national organizations while leading one of the era's leading Country radio stations, KVOO. He worked as an insurance salesman before beginning his career in radio sales at age 39 at KOME. After working in sales at KFMJ and KTOW, Cresse was named Sales Manager at KVOO and was promoted to Vice President and General Manager the following month. Under Jack's leadership the station gained national prominence, winning awards from both the Country Music Association and The Academy of Country Music for best Country Radio Station and best Air Personality. 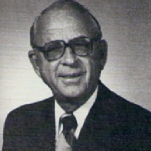 Cresse was one of the founders of the Tulsa Broadcaster's Association and served on the Board of Directors of the ACM and CMA. He was President of the Oklahoma Broadcasters Association and State Chairman of the National Association of Broadcasters' Legislative Liaison Group. Cresse served as State membership Chairman for the NAB. The Oklahoma Association of Broadcasters named him Broadcaster of the Year in 1984, and American Woman is Radio and Television twice named him Radio Manager of the Year. He retired from KVOO in 1987. Cresse died on December 22, 1998 at age 77. Jack Cresse was inducted into the Country Radio Hall of Fame in 2002.